The Gibeon meteorite fell to Earth billions of years ago, exploding into pieces that scattered throughout a field located in what is now Gibeon, Namibia. The discovered remains of this deep space treasure hold intergalactic mystery and a prehistoric significance that make them special stones to use in jewelry with spiritual, sometimes even sacred significance—especially for wedding rings. Our ancestors used meteorites as popular jewelry accents for thousands of years. Ancient civilizations believed that meteorites contained healing properties and often used the space gems in their jewelry. 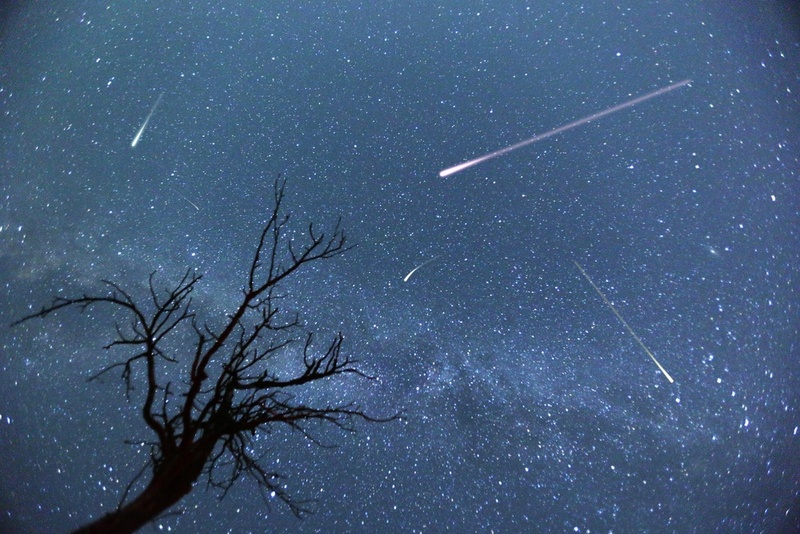 Meteorites exhibit their own unique geologic composition and each metal and mineral composition creates an extraordinary design, which also explains why the dazzling stars were used so often in ancient adornments. 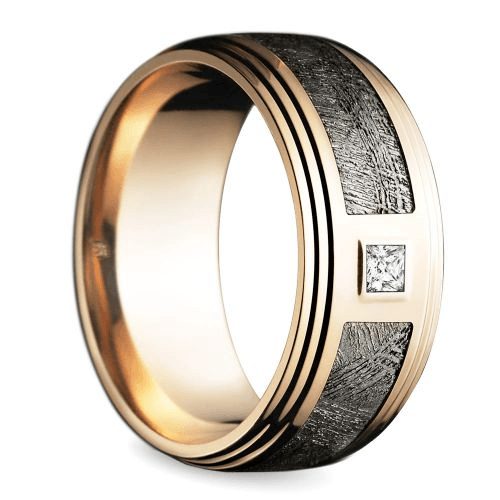 In our day and age, Gibeon meteorite inlays play prominently in the popular design of rugged and cool wedding bands for men. The Widmanstätten pattern adds a stone-like texture to a plain band while hiding a deep space history that has survived and witnessed a mind-blowing space odyssey. Make an ever-after wish on an out-of-this-world ring and place the universe firmly on his hand when sealing your most sacred vows. Prove your love would conquer the cosmos with these magnificent meteorite masterpieces from Brilliance.com. 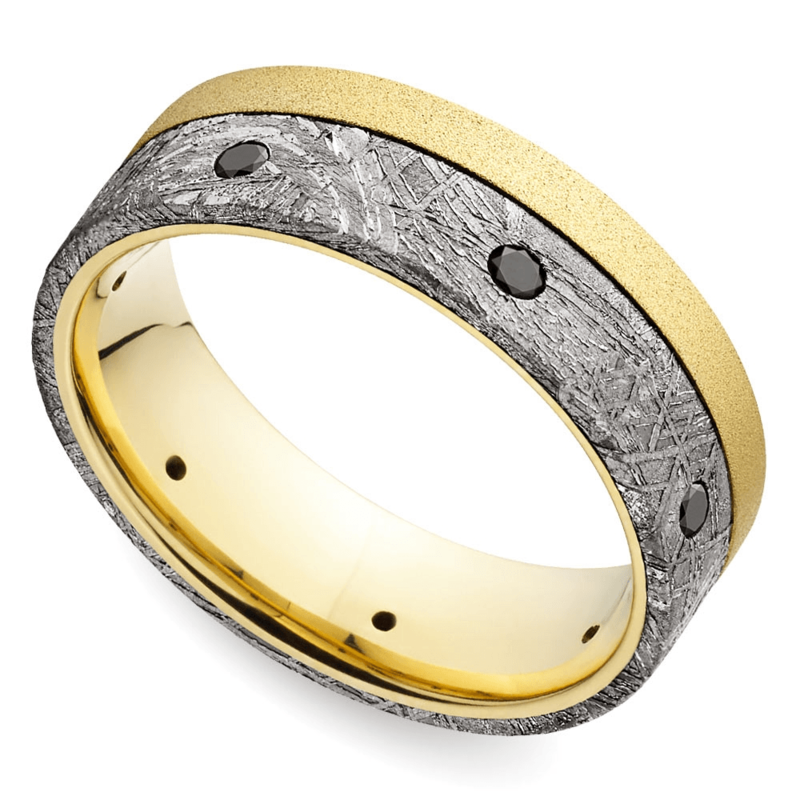 The Black Diamond Men’s Wedding Ring in yellow gold combines two extraterrestrial extravagant gems in one ring. An inlay of genuine Gibeon Meteorite creates rugged texture while one-third carats of black diamonds add star-like intrigue. Black diamonds, also known as carbonado, are known to have a composition that contains a mineral only found in meteors, which suggests deep-space origins for these gems. Like a cosmic traveler passing by the sun, the inlay rests against a yellow gold base for amazing contrast. 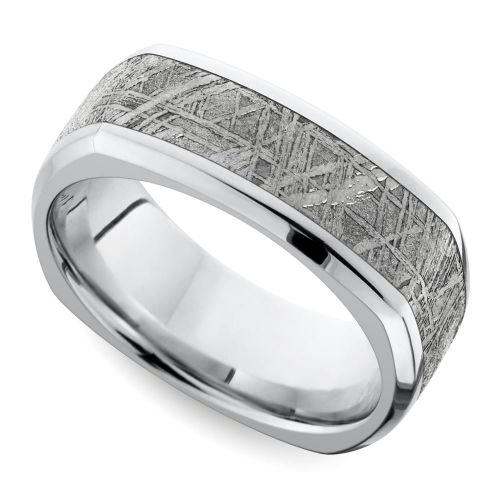 A single princess-cut diamond twinkles like a tiny star in the center of the Grooved Edge Diamond Men’s Ring. An inlay of Gibeon Meteorite creates a picture-frame border around the diamond, creating an eye-catching focal point. Rose gold incorporates warmth, color and a hint of romance, casually complementing the masculinity of the ring. For the man who favors laid-back and casual without sacrificing style and contemporary creativity, choose a ring with an unmistakable shape. The Square Beveled Men’s ring offers sleekness with an edge. A modern square design holds an inlay of Gibeon Meteorite in shiny and durable cobalt. The beveled edge prevents the substantial band from overwhelming his finger. 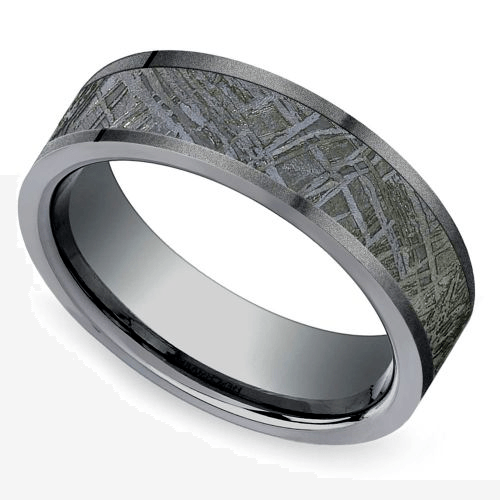 The rough and tumbled texture of sandblasted titanium blends brilliantly with the inlay of meteorite in the Sandblasted Meteorite Inlay men’s ring. 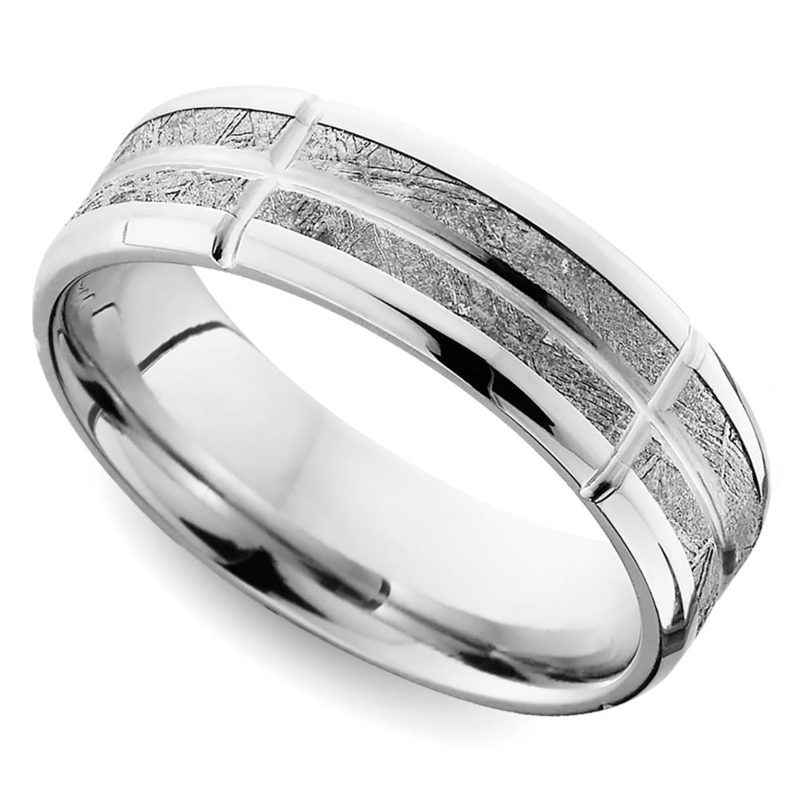 This seven-millimeter band is simple, yet classic and features a comfort fit design. The sandblasting dulls the normal bright white shine of the titanium, allowing the darker gray meteorite to blend seamlessly into the design. If he wants something interesting without diamonds or colored metals, try on the five segments of genuine Gibeon meteorite in the Segmented Meteorite Inlay wedding band. Separated by stately grooved channels carved into a cobalt base, this meteorite inlay creates a window into the universe. Measuring seven millimeters across, the band features a flat design and an easy comfort fit. He gave you his heart, and now you can give him the universe. Channel the wonder and intrigue of outer space by selecting a band accented with genuine Gibeon Meteorite, and prepare to set your vows soaring into space with out-of-this-world brilliance.